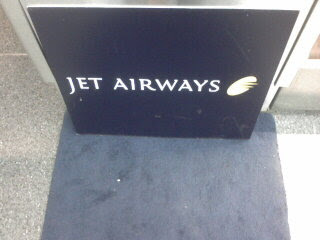 I flew from New York to Chennai on Jet Airways. I had never heard of this airline before, and I wasn't alone. I don't know how many times I had to tell the taxi who was driving me to the airport that I was not flying on JetBlue. I arrived at JFK 2 hours early. The check-in lines were virtually empty. Even though I could have gone into the expedited, first class/business class line, I waited in the regular line. Trying to keep it real! When I got to the front of the line the woman who was checking me in said, "You have a business class ticket. You should have gone in this line," as she pointed to the completely empty expedited line. I said, "I don't mind waiting." She said, "But you deserve the blue carpet service!" I looked down, and there was a tiny, dirty blue carpet. She was kidding around, and we laughed together at her joke. I had read a description of the "premier" seating on the Jet Airways website. They had some pictures of it, too, but I couldn't tell what exactly it was. I was expecting large, comfortable seats, that reclined a little bit more than usual. I was wrong. The "premier" seating was unlike anything I've ever seen. The seats are almost like cubicles. No seat has another seat directly next to it. They all face diagonally into the row. 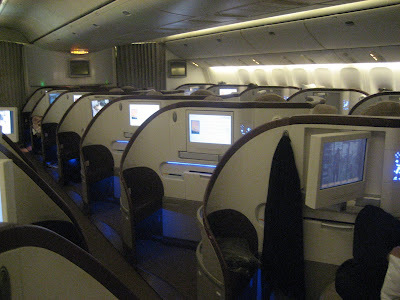 Each seat had its own 15 inch monitor on a swivel. The selection of movies and television shows available to view on demand was impressive: Michael Clayton, No Country For Old Men, etc. But the best part of the seats was the fact that they reclined completely flat. Actually, better than flat because you could control exactly how it reclined, so there were many positions between upright and flat. I usually cannot sleep at all on a plane, but on this flight I was able to get good sleep. Good evening Mr. Adam, may I serve you? The beautiful sound of a flush! Are you shitting (in) me?